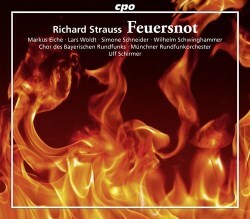 Feuersnot was Strauss’s second opera, following in the wake of the disastrous Munich première of Guntram which had been nearly universally condemned by the critics for its perceived imitation of Wagner. At first this comedy gained a degree of approval, but it was soon eclipsed by the overwhelming triumph of Salome and its successors. Its subsequent career both in the opera house and on record has been patchy. Beecham mounted a 1910 production in London in the wake of his triumphant performance of Elektra earlier the same year, when the work was given in an English translation by the composer William Wallace, which Beecham so enjoyed that he quoted lines from it in his autobiography A mingled chime. The translation included in the booklet here, credited to Susan Maria Praeder, is more literally correct although it lacks Wallace’s witty rhymes with their almost Belloc-ian insouciance. Beecham goes on to observe that Feuersnot failed to find favour with audiences, and his London performances of Salome and Rosenkavalier which soon followed drove the work from the repertoire. Even so it is surprising that Feuersnot has only two alternative versions listed in the currently available catalogue, both deriving from live performances and one of them (conducted by Rudolf Kempe) a real antique in mono sound. There has only been one studio recording in the past: this, with Julia Varady and Bernd Weikl in the two leading roles, has appeared on a couple of labels at various times, but the CD version I own on Acanta comes without any text or translation – which in a comedy like this is a very real drawback despite the excellent sound and performance. It last appeared on the bargain Arts label, but seems now to have disappeared altogether even though second-hand copies are still listed on Amazon for around £10 - new copies at double that, which is more than twice the original Arts price. The only other current stereo competition for this new recording therefore comes from Leinsdorf’s live Berlin recording with the excellent Gundula Janowitz and John Shirley-Quirk (review); and this in its turn is available only as part of a DG compendium of the complete Strauss operas in which some operas are much better served than others. This new release therefore falls to be considered largely in isolation, although I will continue to make references to the old Varady/Weikl version conducted by Hans Fricke. In the first place this new recording, although it employs the same chorus and orchestra as with Fricke, has the obvious advantage of recorded sound that is thirty years more recent than its predecessor, good though that was. There are only two roles of any size, but Fricke boasted more familiar names among the multitude of comprimario members of the cast – Kaja Borris, Friedrich Lenz, Marga Schiml and Kieth Engen to name a few – although none of Ulf Schirmer’s cast are less than adequate in the occasional contributions they are called upon to make. Conducting honours too are more or less even, with Schirmer only slightly brisker and dispatching the score in about a minute and a half less time than Fricke — a very minor difference in a work of this length. The more modern recorded sound is better differentiated than either of the earlier stereo versions. Which brings us down to the comparisons between Julia Varady and Simone Schneider, and between Bernd Weikl and Markus Eiche. Both Schneider and Eiche have impressive credentials in the fields of Wagner and Strauss; although the former began her career as a high coloratura singing the Queen of the Night and Zerbinetta, her more recent Straussian roles have included the Marschallin in Der Rosenkavalier, the Empress in Die Frau ohne Schatten and Chrysothemis in Elektra. She is fully the equal of Varady, with a warmth and sense of Straussian line which approach the incomparable Janowitz. Eiche, although again he yields some points of detail to Shirley-Quirk, has a beautiful sense of presence although he could be more potent when he pronounces his curse on the citizens of Munich — with shades of Strauss’s reaction to their reception of Guntram. Here Weikl’s greater bullishness and strength of venom does pay dividends. One point of comparison: while both the CPO and Acanta sets make the inevitable break between CDs at the same point, the Acanta set — at least in the version I own — has only one track per side, which is a major disadvantage if you wish to play just one section of the work – such as the final ‘Love scene’ at the end which Strauss himself extracted as an orchestral piece for separate performance. Indeed, it is in its presentation that this new issue really scores: not only the provision of separate tracks, but also the fact that unlike all its rivals it furnishes a complete text and translation. It also provides a thought-provoking essay on the work itself by Laurenz Lütteken which does not always avoid the prolixity of academicism which sometimes afflicts CPO’s booklet notes but manages to read well in the translation by the long-suffering Susan Marie Praeder - who in the past has sometimes had to cope, not always successfully, with the farthest-flung reaches of German musical technical terms. For those who already own Feuersnot in either of the versions by Varady and Weikl under Fricke, or Janowitz and Shirley-Quirk under Leinsdorf, there may be no real need for the Straussian to feel the urgency of replacing these earlier discs. For those coming fresh to the work, this must now be the recording of choice. It yields few if any points to its predecessors, and provides a fully documented introduction to a work which deserves to be treated as more than just a curiosity of interest only to Strauss completists. The cover illustration is good, too.